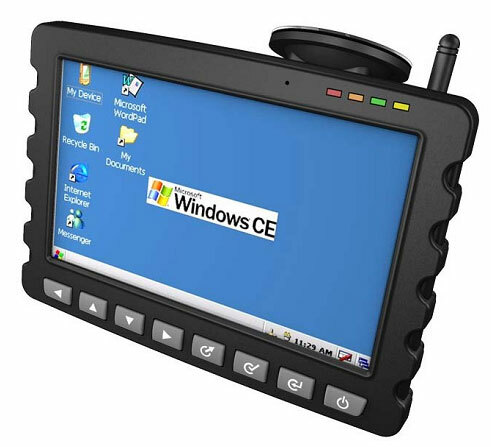 The CTFPND-5 is a 7" Touchscreen PND on Windows CE 5.0 basis with integrated GPS receiver and GSM/GPRS modem. Therefor the CTFPND-5 is the perfect plattform for your telematics application. The extra-high native resolution of 800x480 enables a perfect viewing quality. This device also is equipped with 4x IO, 1x Host-USB and 3x RS232. The 8 buttons (with LED backlight) at the front can be used in your software application. With some improved hardware configuration, this device can be PERFECT PND! Just need higher processor, as Sirf Atlas V at 600 MHz and minimal 128 Mb RAM memmory, maybe 4 Gb or more internal storage.